Republican presidential primary results in Michigan, Mississippi, Idaho, and Hawaii. Donald Trump pauses with supporters after speaking at the Mississippi Coast Coliseum on Jan. 2, 2016 in Biloxi, Mississippi. Update, 1:00 a.m.: Ted Cruz managed to get on the board Tuesday night with a win in Idaho, after registering what appear to be double-digit losses to Trump in both Michigan in Mississippi. The win, coupled with Rubio tanking across the board, will surely amplify the Texas senator’s claim to be the alternative to Trump. Update, 10:00 p.m.: Donald Trump gave a meandering victory speech in Jupiter, Florida, after being declared the winner of Michigan. Trump defended his business acumen by bringing some schwag to the event—including Trump-brand steaks, wine, water, and magazines. 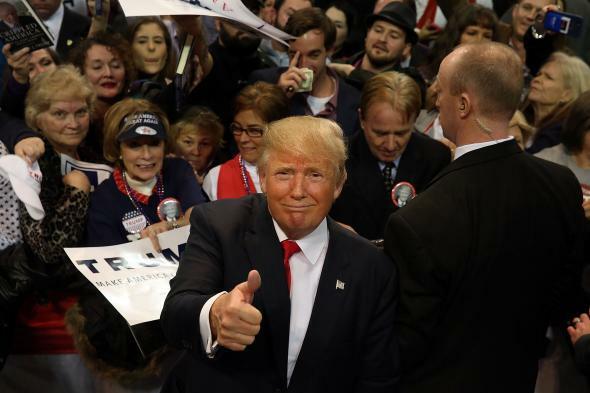 Candidate Trump largely stuck to now-familiar digs and derision about his rivals and the Republican establishment that has come after him with renewed vigor in recent weeks. Mitt Romney and Lindsey Graham were singled out for recent criticism of Trump. Update, 9:02 p.m: Trump wins Michigan. Update, 8:25 p.m.: Trump wins Mississippi. Original Post: Republican contenders Donald Trump, Ted Cruz, Marco Rubio, and John Kasich are squaring off in four more states Tuesday night. Ben Carson is officially out of the running (right? ), which adds a handful of percentage points back into the hopper. Michigan is the biggest delegate haul of the night with 59, followed by Mississippi’s 40, Idaho with 32, and Hawaii’s chill 19 delegates. Heading into the evening, the race appears to be tightening in national polling with Trump’s lead thinning out and, bad news for the Rubio camp, Kasich now running third ahead of the Florida senator. 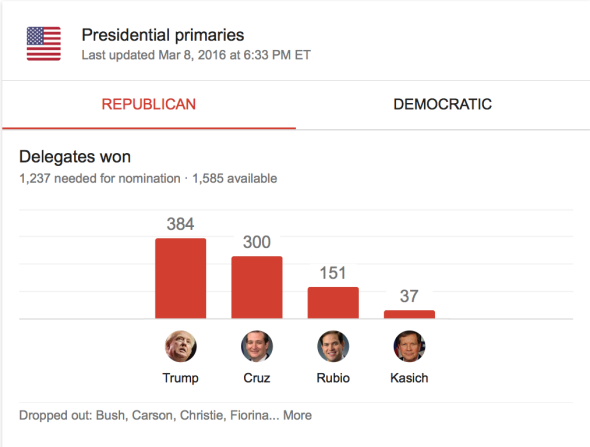 In the all important delegate count, with 1,237 needed for nomination, Trump still holds a commanding lead. Stay tuned, and we’ll keep you updated throughout the evening with the latest results.